During the past week, dusty conditions continued along the retreating seasonal south polar ice cap edge. 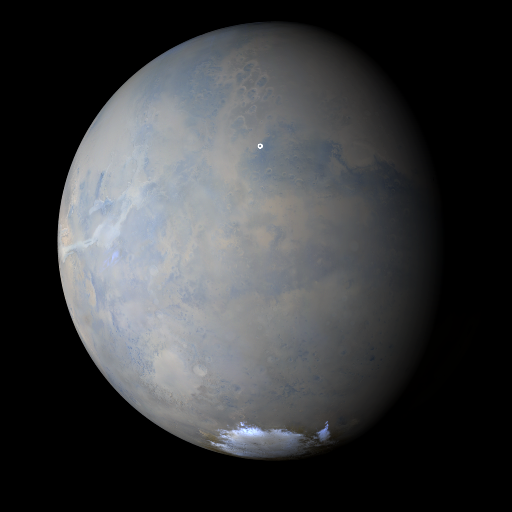 Sites of activity included Aonia, southern Sirenum, and southwest of Hellas — near the ‘Mountains of Mitchel.’ Looking further northward, dust lifting was relatively uneventful apart from a local-scale dust storm over northern Amazonis near week’s end. Condensate water ice clouds endured above Arsia Mons (southernmost volcano of the Tharsis Montes), signaling a return to seasonal martian norms after the recent planet-encircling dust event. Varying dust hazes continued over both rover sites, Gale Crater (Curiosity) and Endeavour Crater (Opportunity) each sol. Malin, M. C., B. A. Cantor, A. W. Britton (2018), MRO MARCI Weather Report for the week of 17 September 2018 – 23 September 2018, Malin Space Science Systems Captioned Image Release, MSSS-549, http://www.msss.com/msss_images/2018/09/26/.